As reported in an article in the well-respected scientific magazine "Nature" in April, 2002 the results of researches led by the Field Museum of Chicago have resulted in a revision of the primates evolutionary tree. 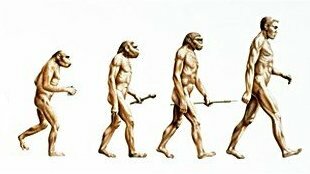 The origin of primates has been pushed back from 65 million years ago to 85 million years ago, before the dinosaurs became extinct. 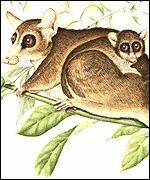 According to Dr. Martin vice president of academic affairs at The Field Museum and co-author of the research, who has studied primate evolution from many different perspectives for the past 30 years, their 85-million-year-old earliest common ancestor probably looked like a primitive, small-brained version of today's dwarf lemur. The sciences hold that there were many naturally occuring changes in physique and behaviour - some of these proved beneficial in terms of survival - and were locally reinforced by such "successes-in-survival" allowing several branching divergences, based on these survival-favouring changes, to produce a primate evolutionary tree of related species. The changes that allowed Humans to feature as part of a human / primate family tree, and which allowed Humanity to become established as we know it today, being very slowly accumulated due to various "survival advantages" that these changes conferred allowing their possessors to be more generally successful in the struggle for life but particularly so in the gaining of foodstuffs to nourish themselves, their families, and their friends. At age-of-the-sage we are more truly interested in the origins of Human Psychology and Spirituality than in the origins of Human Physique.